TSPSC Departmental Tests 2018 Response Sheets, May, November Results: TS Departmental Tests 2018 Response Sheets. 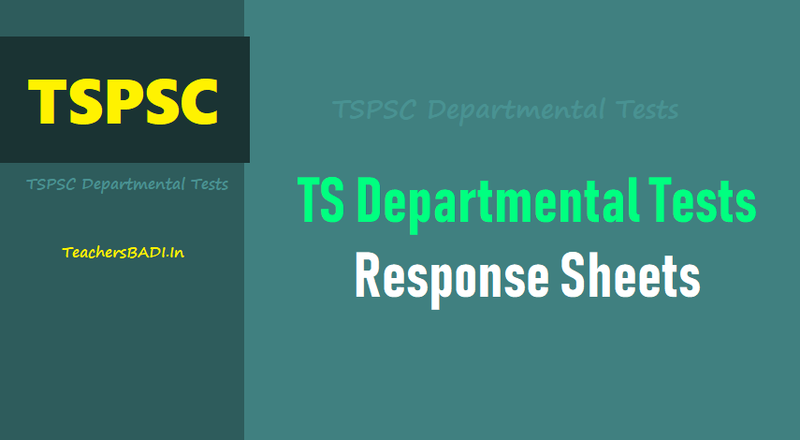 TSPSC Departmental Tests May 2018 Session Written exam Response Sheets. TSPSC has conducted Written Examination for the above notification from 20/07/2018 to 28/07/2018 through CBRT for objective type papers. The Response Sheets of these objective type exams will be available on TSPSC website from 04/08/2018. Departmental Tests November 2018 Session notification was issued on 31/10/2018 and Applications were accepted through online from 05-11-2018 to 31-11-2018 from the Commission’s official web-site www.tspsc.gov.in. Departmental Test examinations of November 2018 Session (31/2018) held from 27/12/2018 to 06/01/2019 in On-Line Mode introducing CBT Method were conducted in 9 District Head Quarters of Telangana State including Hyderabad clubbed with Ranga Reddy and in HMDA Limits. The candidates who have applied and attended the exam may download the Response Sheets from Commission’s official website www.tspsc.gov.in from 30-01-2019 onwards. The Response Sheets may be preserved carefully for all future needs. In case of any difficulty in downloading the Response Sheets, the candidates may contact through Help-Desk with Land Line No. 040-24606666 or 040-24655555 to be rectified the problem. As per the Public Service Commission Regulations, Telangana State Public Service Commission conducts Departmental Examinations for employees working in various Departments under State Government of Telangana. The Commission conducts Departmental Examinations twice a year i.e., in May and November for the promotions to the employees. The Departmental examinations are held at thirty one (31) District Headquarters including Hyderabad. The candidates are admitted to the District Centre concerned where the candidates are presently working. Step 3: Click on the "DEPARTMENTAL TESTS (15/2018) - Q.P. RESPONSE SHEETS TO DOWNLOAD"